These gluten-free chocolate pancakes will feed your brunch obsession. 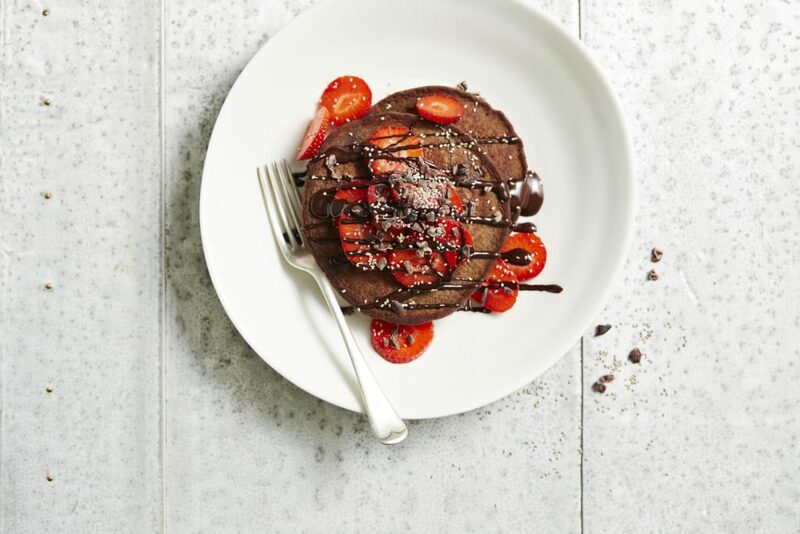 Topped with fresh fruit, crunchy buckwheat groats and a decadent melted chocolate, the whole fam will love these quick and easy pancakes! They taste delicious and are perfect for a guilt free indulgence. 1 cup milk of your choice (full-fat, almond, oat, rice). Butter or coconut oil, for frying. 50 g dark chocolate, melted. 100 g strawberries, hulled and sliced. 1. Place eggs and milk in a large mixing bowl. Whisk together. 2. Add almond meal, buckwheat flour, cacao and baking powder into the mixing bowl. Stir mixture with a wooden spoon until smooth. 3. Heat a large frypan over low-medium heat. Grease the pan with a little butter and add in ¼ cup of mixture per pancake. Cook for 2–3 minutes until bubbles appear on the surface, then flip and cook for another one minute. 4. Place pancakes onto an ovenproof dish and place into an oven on 140°C/275°F/Gas Mark 1 to stay warm while you cook the remaining pancakes. 5. Serve pancakes with your choice of toppings.